This lovely salad is a fusion of a creamy American potato salad and the one from India known as aloo chaat. Any waxy potatoes will work, so find out what is in season and use those as they will have the best flavour. The radishes add bite and crunch to this salad, but you can add any other vegetable you like - try finely sliced fennel, cucumbers, celery or even fine beans. 1. Place the potatoes in a large pot, cover with plenty of water and bring to a boil. Boil until the tip of a knife goes through them easily, around 15-20 minutes. 2. Meanwhile, make the dressing. Mix together the lemon juice, mayonnaise, soured cream, half the oil and the garlic paste. Heat the remaining oil in a small saucepan, tilting it so the oil collects in one area. When hot add the mustard and cumin seeds, then after a few seconds, the fennel seeds. Turn the heat down and cook for another 10 seconds or until the popping dies down. Stir into the dressing. 3. Drain the cooked potatoes and peel as soon as they are cool enough to handle; halve if small or quarter larger ones. Stir into the dressing along with the red onions and chillies. The potatoes will absorb the dressing as they cool. Stir in the radishes and coriander just before serving. 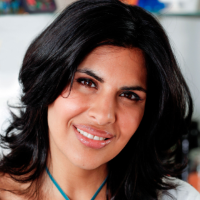 Click here to see Anjum Anand’s Tandoori salmon.